Is a Bichon Maltese Mix the Right Dog for You? These mixed breed dogs are often given specific names, but keep in mind that they are not a separate dog breed. According to Maltichon owners, these dogs are very affectionate and look like fluffy, white cotton balls. Read more about this Maltese mix below. Please do not purchase these dogs from a breeder. There is no need to create more mutts when plenty are available for adoption. If you discover a Maltese mix that would fit well with your family, you can easily adopt one at a Maltese Dog Rescue instead (and for a lot less money)! 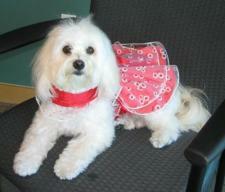 Do you have a Bichon Maltese mix? Click here to join us on Facebook and post pictures of your lil cutie for everyone to see! These dogs take on the temperament of both Bichons and Maltese. They are lively and affectionate little dogs. Most are very intelligent; which makes them easy to train. You may find them difficult to housebreak, as with any smaller dog. They are great dogs for agility and obedience competitions, as they learn quick and get along with everyone. These dogs do wonderful with children and other dogs. Most people find them to have a willful and clownish personality. If you already have a Bichon Maltese mix or know someone that does, check out these unique gifts for Maltichon dog lovers below. If you like a little white puffball, than this Maltese mix might be right for you! 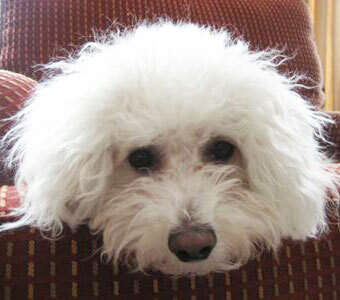 Since both the Bichon Frise and the Maltese are white, this hybrid dog is also always white. Hair is usually soft, fine, and loosely curled. These dogs should be professionally groomed every 4 weeks to keep hair trimmed and clean. They are also non-shedding and most are hypoallergenic. Full grown Bichon Maltese mixes can weigh anywhere from 6-15lbs.